I’m on sabbatical working on an text (Introductory Computational Physics using Python) and, to take a break from writing, I am also writing interesting questions to better prepare our physics students for the physics GRE, and well, because it’s fun to think about physics. So, here’s a question I wrote (thinking that the answer wouldn’t be too hard to derive—ha!) that turns out to be more interesting than I thought. First, the question as stated, with the geometry shown in the figure at the right. and the magnetic field is into the page along the -x direction. 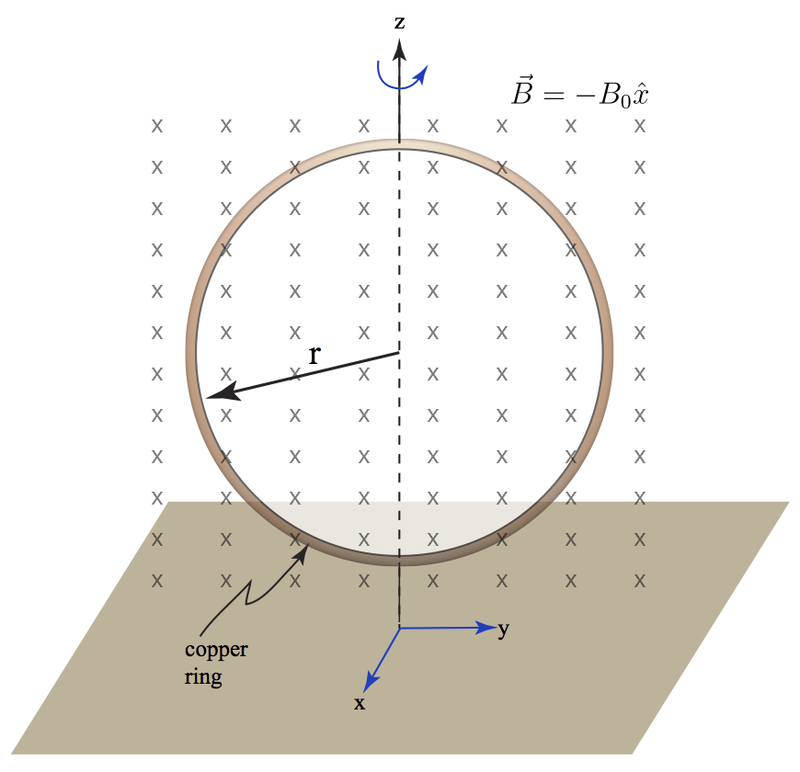 If the intial angular velocity of the copper ring is , calculate the time it will take for it to drop to of this initial value, using the assumption that the dissipated energy goes into Joule heat. You may use the fact that the resistivity of copper is m and its density is 8900 kg/m . How does your answer depend on the radius of the ring, and it’s cylindrical wire radius ? This problem has a lot of depth and subtlety. Sit down with a pen and paper and derive the initially non-linear differential equation for the angular velocity (by considering kinetic energy dissipation), make an appropriate approximation and presto, your equation is simple to solve. The above hint is the only analytical way I can see to solve this problem…approximately, anyway. And, if you’re paying attention, you might wonder why I asked you to consider kinetic energy dissipation and not total energy dissipation. Why not include the magnetic dipole potential energy term ? I think that the answer to this is going to be non-trivial and might depend on fully understanding the January 1999 paper in the American Journal of Physics entitled: Magnetic dipole orientation energetics by G. H. Goedecke and Roy C. Wood. In any case, one can work out the “exact” dynamics by equating the magnetic torque on the induced dipole moment to the rate of change of angular momentum and avoid energy considerations entirely, obtain a non-linear differential equation and find the resulting dynamics. I turned to Python and SciPy to write a quick snippet to solve this in the iPython Notebook. More when I post a solution.